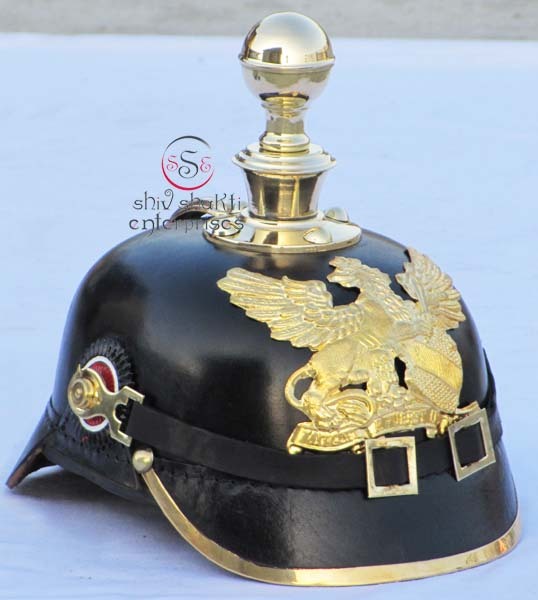 Leather pickelhaube helmet with Brass FR Eagle Badge. It is Handmade as a original one with a leather skull, german brass rivet and edgings, it has adjustable Belt, the front badge is a beautifully hand crafted eagle in brass, the originals of the helmets are rarely found and way too expensive, it is one of the best copies of the german leather helmet. Leather pickelhaube helmet with "FR Eagle Badge". It is Handmade as a original one with a leather skull, german brass rivet and edgings, it has adjustable Belt, the front badge is a beautifully hand crafted eagle in brass, the originals of the helmets are rarely found and way too expensive, it is one of the best copies of the german leather helmet. 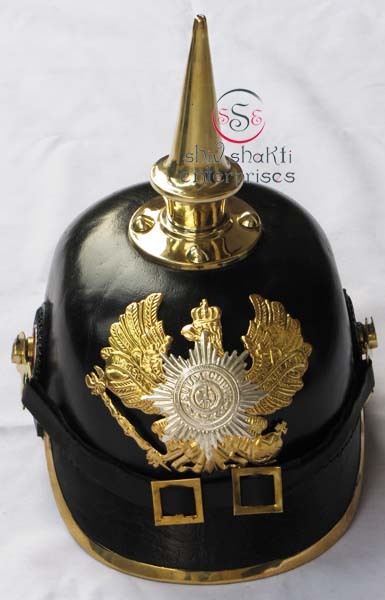 Leather pickelhaube helmet with "Gold FR Eagle Badge". Made of leather with brass fittings. 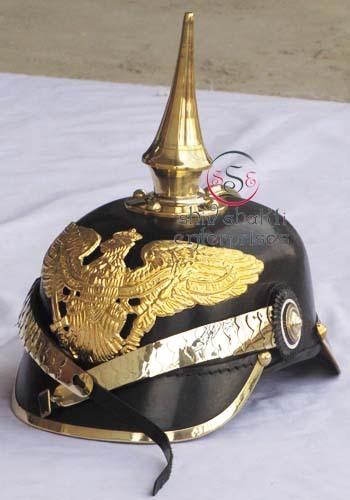 It is Handmade as a original one with a leather skull, german brass rivet and edgings, it has adjustable Belt, the front badge is a beautifully hand crafted eagle in brass, the originals of the helmets are rarely found and way too expensive, it is one of the best copies of the german leather helmet. 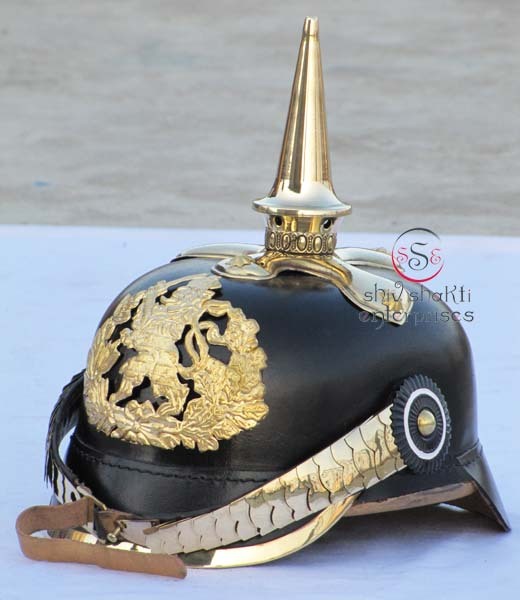 Leather pickelhaube helmet with "Gold FR Eagle Badge ﻿With Round Spike". Made of pure leather & brass fitting. Inner leather liner for comfort wearing. Wearable & excellent collectible & used for reenactments. 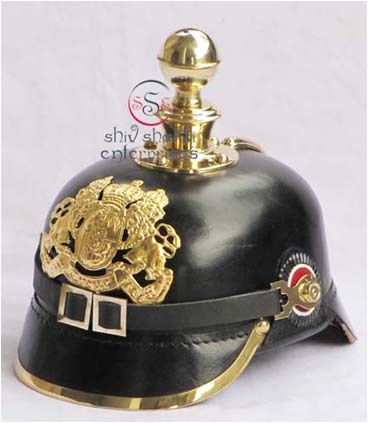 Perfect reproduction of German Leather Pickelhaube Helmet. Leather pickelhaube helmet with FR Eagle Badge. It is Handmade as a original one with a leather skull, german brass rivet and edgings, it has adjustable Belt, the front badge is a beautifully hand crafted eagle in brass, the originals of the helmets are rarely found and way too expensive, it is one of the best copies of the german leather helmet. 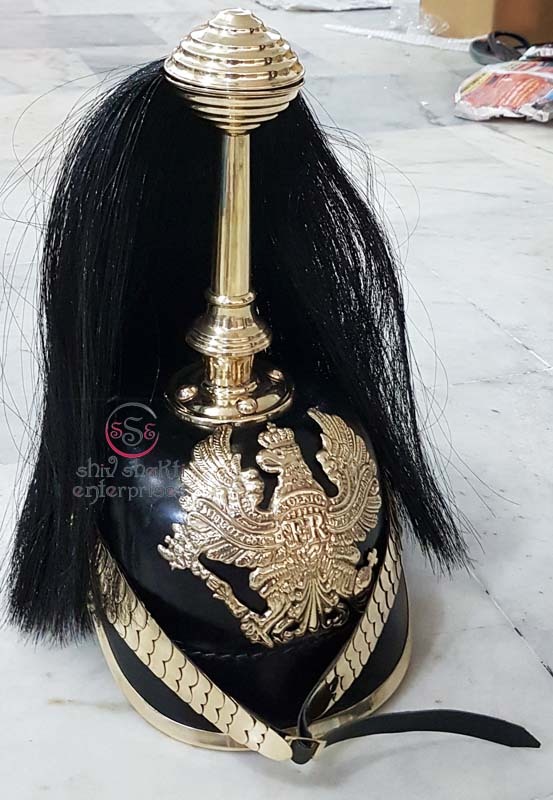 Leather pickelhaube helmet with Long Tail. It is Handmade as a original one with a leather skull, german brass rivet and edgings, it has adjustable Belt, the front badge is a beautifully hand crafted eagle in brass, the originals of the helmets are rarely found and way too expensive, it is one of the best copies of the german leather helmet. ﻿This Leather Helmet is made of leather with brass fitting. This helmet with FR Eagle Badge with Small Spike. 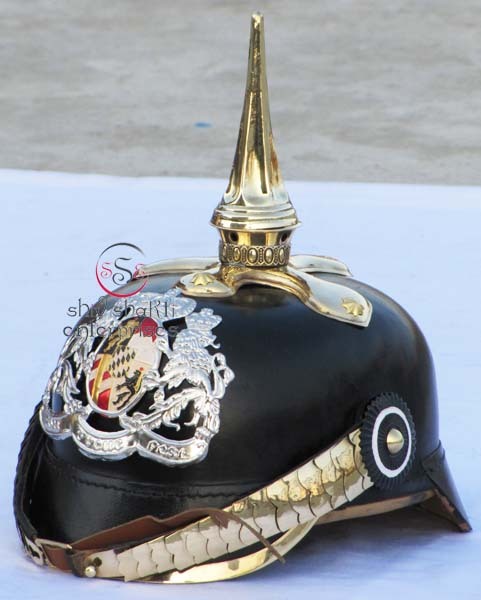 Our client can avail a premium range of Baden Pickelhaube Leather Helmet Which are known for its special features like eye-catching design, hand crafted, good finishing and anti corrosive. These are hand crafted of real leather like original with authentic brass hardware. 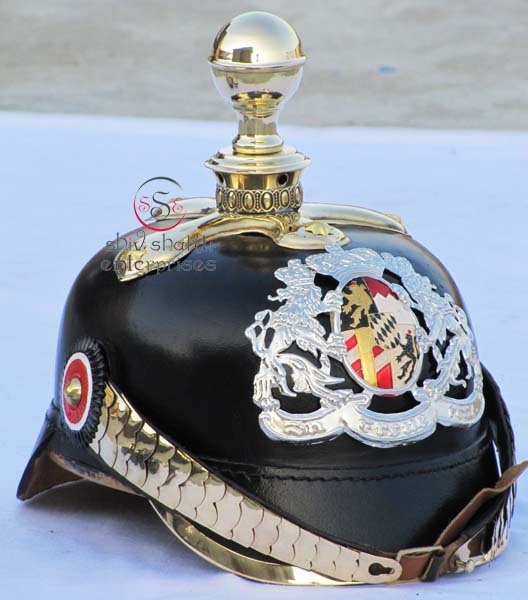 Leather pickelhaube helmet with Silver Flower Badge. It is Handmade as a original one with a leather skull, german brass rivet and edgings, it has adjustable Belt, the front badge is a beautifully hand crafted eagle in brass, the originals of the helmets are rarely found and way too expensive, it is one of the best copies of the german leather helmet. 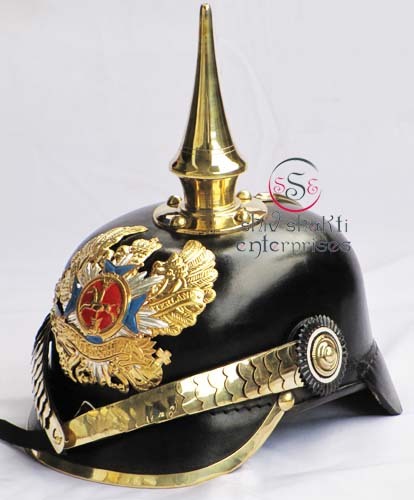 Leather pickelhaube helmet with "Gold Flower Badge W/ Small Spike". Made of leather with brass fittings. 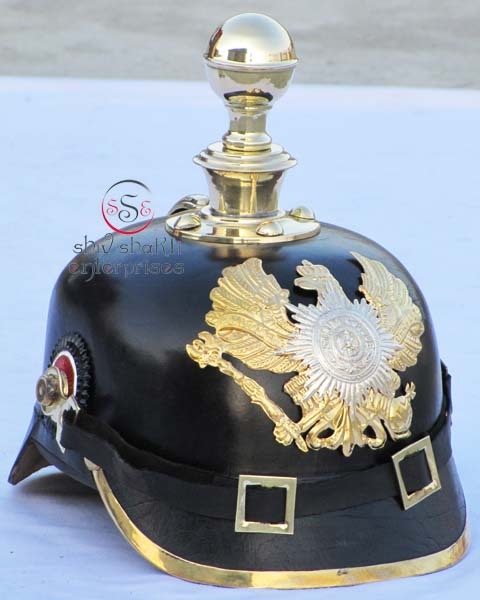 It is Handmade as a original one with a leather skull, german brass rivet and edgings, it has adjustable Belt, the front badge is a beautifully hand crafted eagle in brass, the originals of the helmets are rarely found and way too expensive, it is one of the best copies of the german leather helmet. 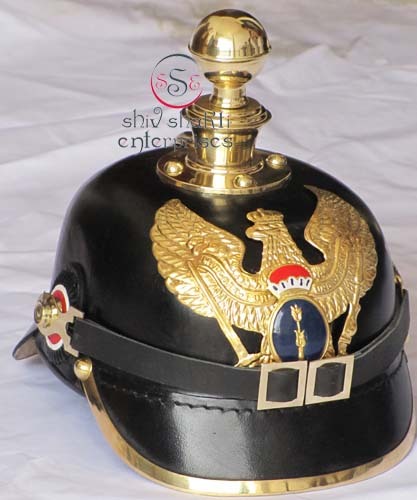 Leather pickelhaube helmet with Gold FR Eagle Badge w/ Suum Cuique Badge with long spike. 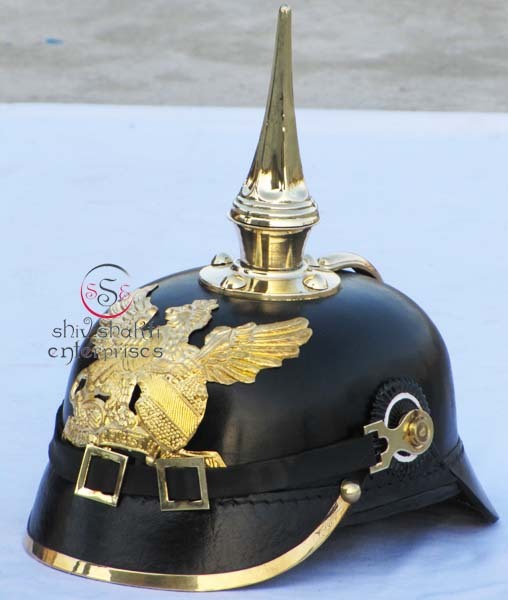 It is Handmade as a original one with a leather skull, german brass rivet and edgings, it has adjustable Belt, the front badge is a beautifully hand crafted eagle in brass, the originals of the helmets are rarely found and way too expensive, it is one of the best copies of the german leather helmet. 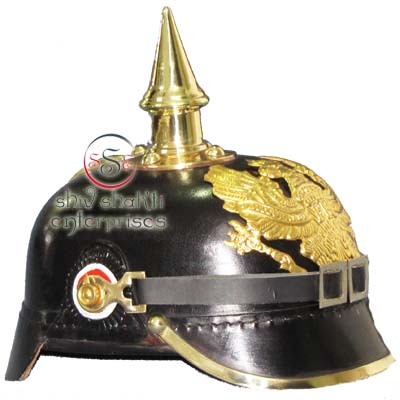 Leather pickelhaube helmet with "Gold Big Eagle With Silver Suum Cuique Badge W/ Long Spike". It is Handmade as a original one with a leather skull, german brass rivet and edgings, it has adjustable Belt, the front badge is a beautifully hand crafted eagle in brass, the originals of the helmets are rarely found and way too expensive, it is one of the best copies of the german leather helmet. 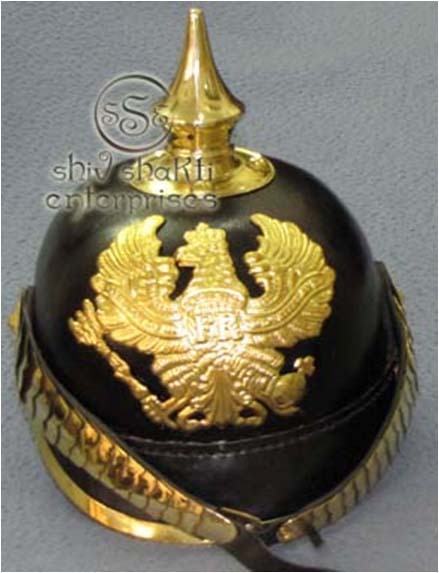 Leather pickelhaube helmet with "Gold FR Eagle Badge w/ Long Spike". Made of leather with brass fittings. 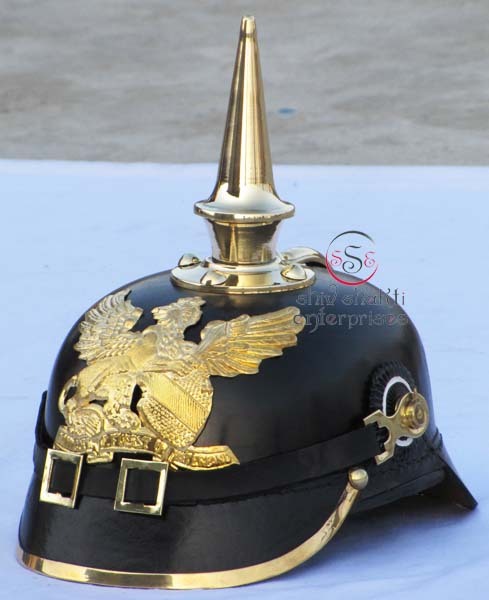 It is Handmade as a original one with a leather skull, german brass rivet and edgings, it has adjustable Belt, the front badge is a beautifully hand crafted eagle in brass, the originals of the helmets are rarely found and way too expensive, it is one of the best copies of the german leather helmet. 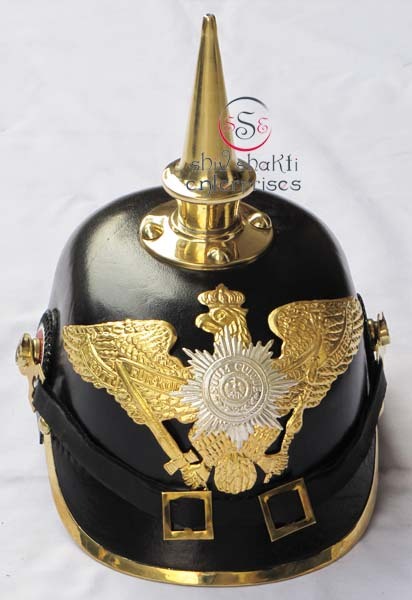 Leather pickelhaube helmet with Gold FR Eagle Badge with Suum Cuique Badge. It is Handmade as a original one with a leather skull, german brass rivet and edgings, it has adjustable Belt, the front badge is a beautifully hand crafted eagle in brass, the originals of the helmets are rarely found and way too expensive, it is one of the best copies of the german leather helmet. 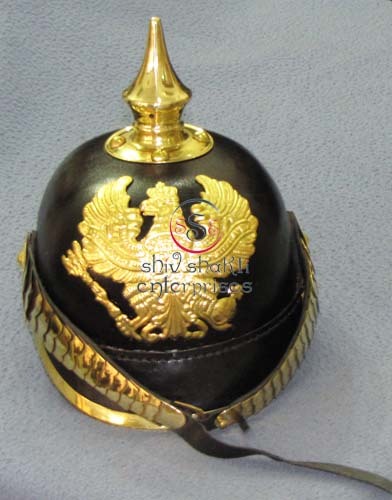 Leather pickelhaube helmet with "Gold Big Eagle With Silver Suum Cuique Badge". 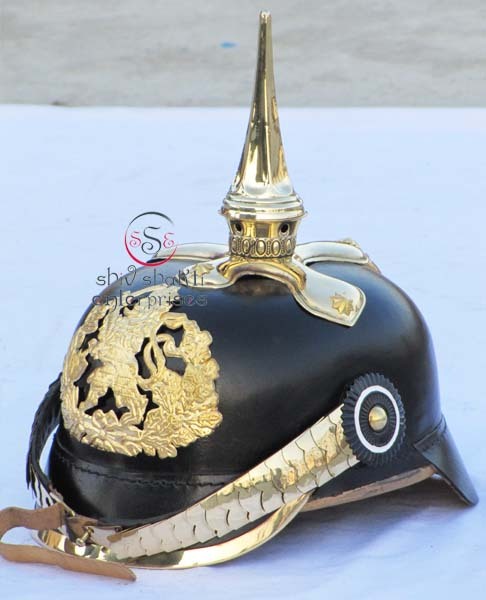 It is Handmade as a original one with a leather skull, german brass rivet and edgings, it has adjustable Belt, the front badge is a beautifully hand crafted eagle in brass, the originals of the helmets are rarely found and way too expensive, it is one of the best copies of the german leather helmet. 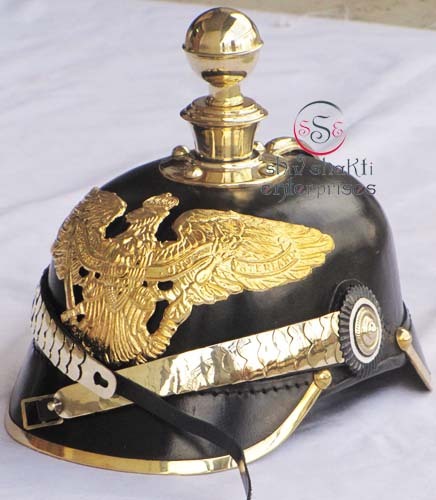 Leather pickelhaube helmet with "Gold FR Eagle". Made of leather with brass fittings. It is Handmade as a original one with a leather skull, german brass rivet and edgings, it has adjustable Belt, the front badge is a beautifully hand crafted eagle in brass, the originals of the helmets are rarely found and way too expensive, it is one of the best copies of the german leather helmet. Leather pickelhaube helmet with "FR Badge Enlist Spike W/ Leather Belt". Made of leather with brass fittings. 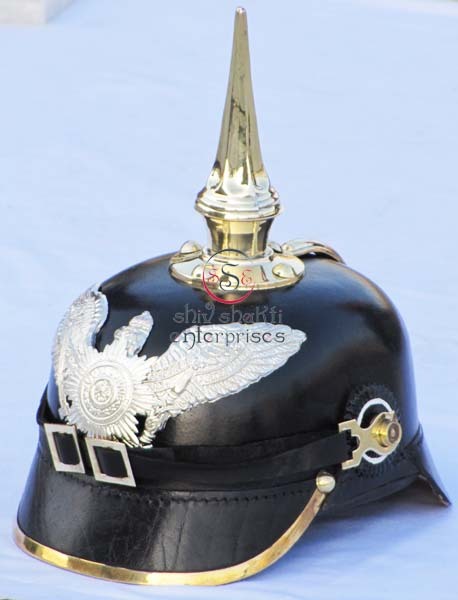 It is Handmade as a original one with a leather skull, german brass rivet and edgings, it has adjustable Belt, the front badge is a beautifully hand crafted eagle in brass, the originals of the helmets are rarely found and way too expensive, it is one of the best copies of the german leather helmet. 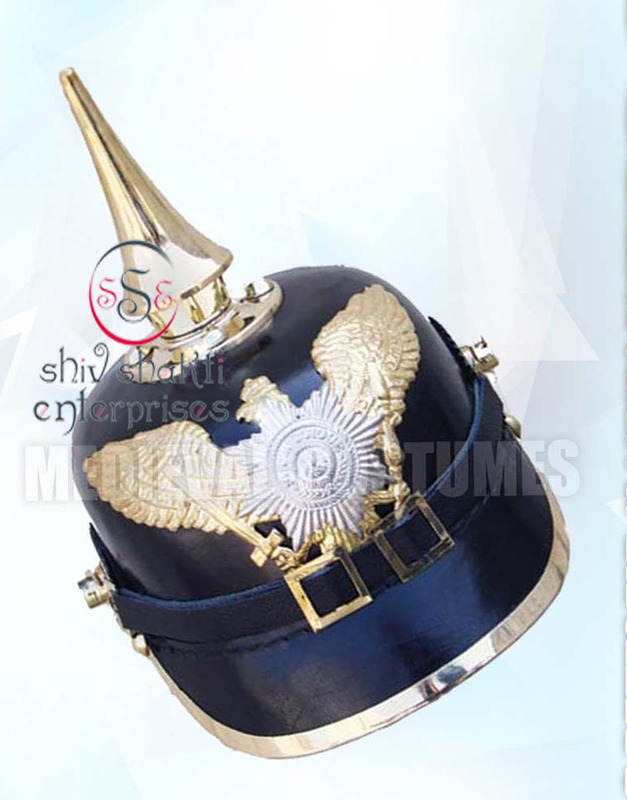 Leather pickelhaube helmet with "Silver Big Eagle W/ Spike". Made of leather with brass fittings. It is Handmade as a original one with a leather skull, german brass rivet and edgings, it has adjustable Belt, the front badge is a beautifully hand crafted eagle in brass, the originals of the helmets are rarely found and way too expensive, it is one of the best copies of the german leather helmet. 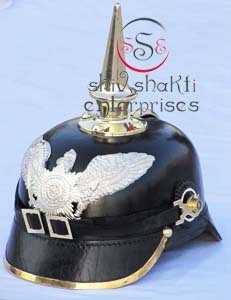 Leather pickelhaube helmet with "Silver Big Eagle Badge W/ Spike". Made of leather with brass fittings. It is Handmade as a original one with a leather skull, german brass rivet and edgings, it has adjustable Belt, the front badge is a beautifully hand crafted eagle in brass, the originals of the helmets are rarely found and way too expensive, it is one of the best copies of the german leather helmet. 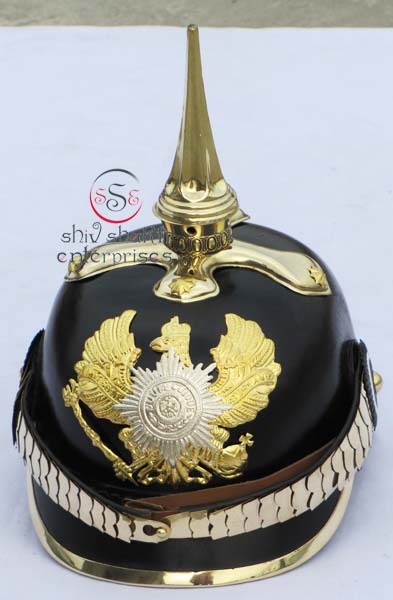 Leather pickelhaube helmet with "Gold Big Eagle With Silver Suum Cuique Badge W/ Ball Spike". It is Handmade as a original one with a leather skull, german brass rivet and edgings, it has adjustable Belt, the front badge is a beautifully hand crafted eagle in brass, the originals of the helmets are rarely found and way too expensive, it is one of the best copies of the german leather helmet. 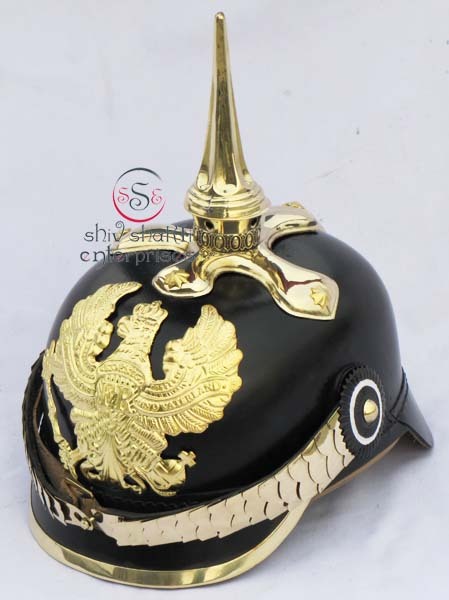 Leather pickelhaube helmet with "Gold Big Eagle With Silver Suum Cuique Badge W/ Spike". It is Handmade as a original one with a leather skull, german brass rivet and edgings, it has adjustable Belt, the front badge is a beautifully hand crafted eagle in brass, the originals of the helmets are rarely found and way too expensive, it is one of the best copies of the german leather helmet. ﻿This Leather Helmet is made of leather with brass fitting. This helmet with Silver Bavarian Badge With Spike. 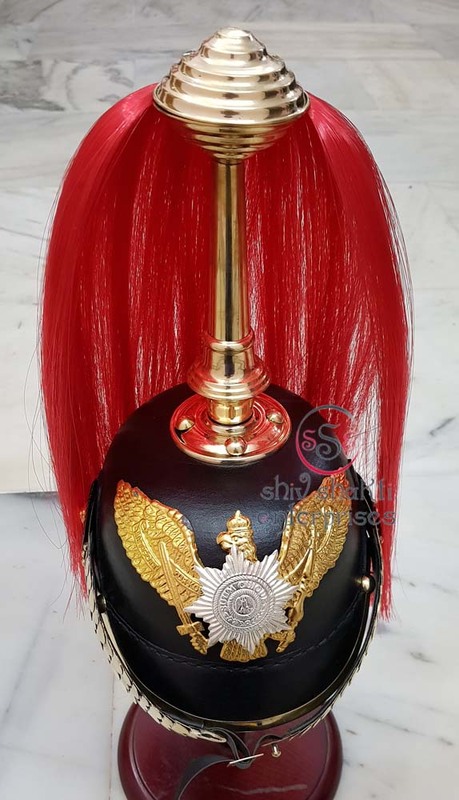 Our client can avail a premium range of Baden Pickelhaube Leather Helmet Which are known for its special features like eye-catching design, hand crafted, good finishing and anti corrosive. These are hand crafted of real leather like original with authentic brass hardware. 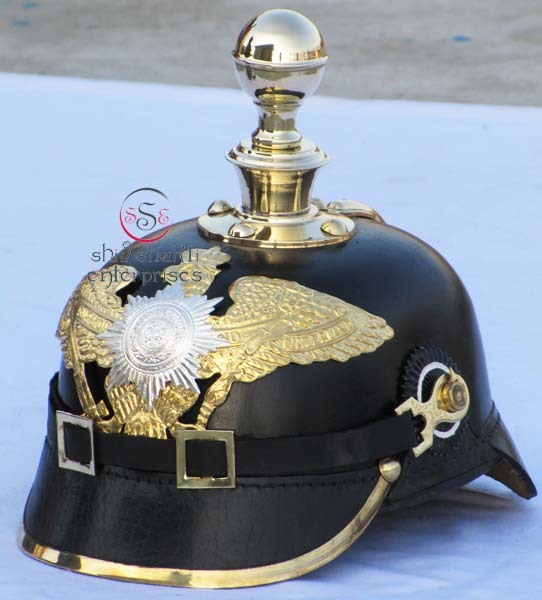 Leather pickelhaube helmet with Gold FR Eagle Badge With Brass Strip. It is Handmade as a original one with a leather skull, german brass rivet and edgings, it has adjustable Belt, the front badge is a beautifully hand crafted eagle in brass, the originals of the helmets are rarely found and way too expensive, it is one of the best copies of the german leather helmet. 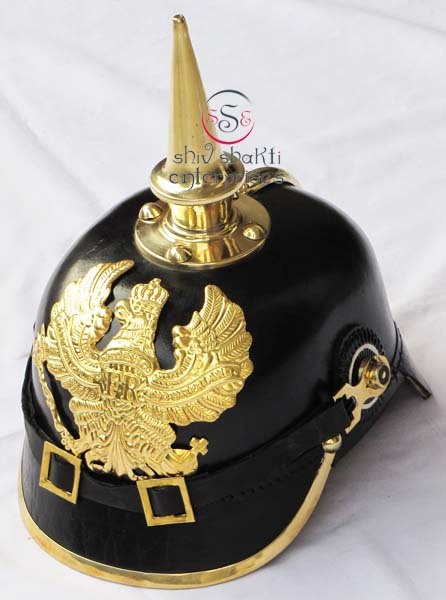 Leather pickelhaube helmet with Gold FR Eagle Badge With Brass Long Spike. It is Handmade as a original one with a leather skull, german brass rivet and edgings, it has adjustable Belt, the front badge is a beautifully hand crafted eagle in brass, the originals of the helmets are rarely found and way too expensive, it is one of the best copies of the german leather helmet. 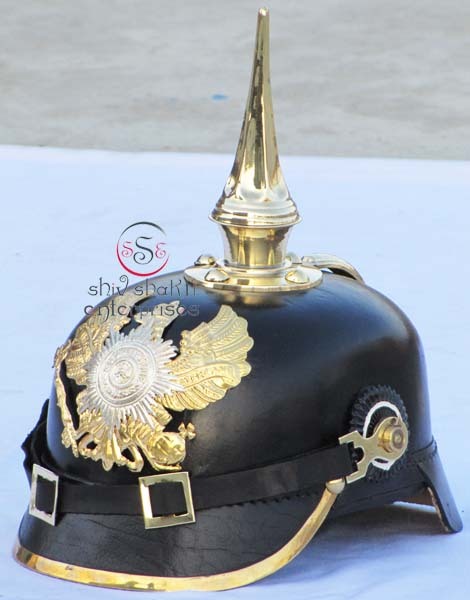 Leather pickelhaube helmet with Gold Eagle Badge With Brass Ball Spike. It is Handmade as a original one with a leather skull, german brass rivet and edgings, it has adjustable Belt, the front badge is a beautifully hand crafted eagle in brass, the originals of the helmets are rarely found and way too expensive, it is one of the best copies of the german leather helmet. 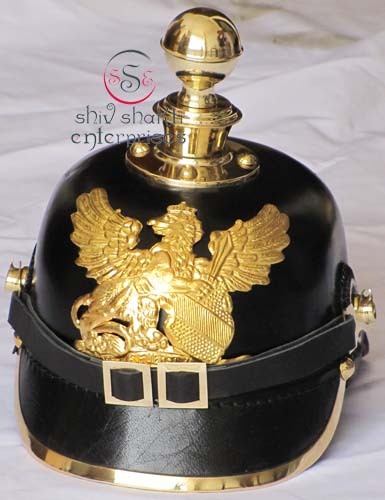 Leather pickelhaube helmet with Gold Eagle Badge With Brass Simple Spike. It is Handmade as a original one with a leather skull, german brass rivet and edgings, it has adjustable Belt, the front badge is a beautifully hand crafted eagle in brass, the originals of the helmets are rarely found and way too expensive, it is one of the best copies of the german leather helmet. 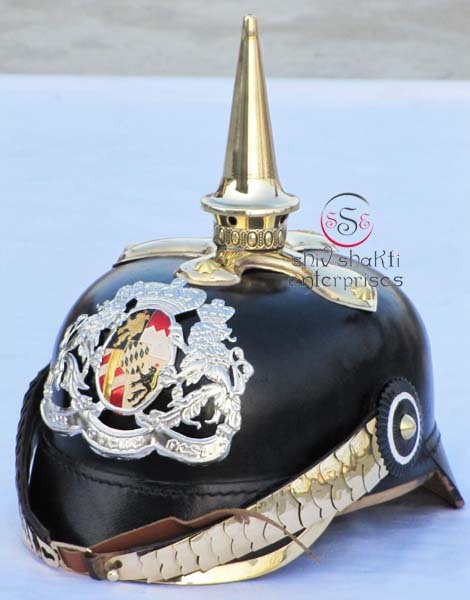 Leather pickelhaube helmet with "Gold FR Eagle With Silver Suum Cuique Badge W/ Spike". Made of leather with brass fittings. It is Handmade as a original one with a leather skull, german brass rivet and edgings, it has adjustable Belt, the front badge is a beautifully hand crafted eagle in brass, the originals of the helmets are rarely found and way too expensive, it is one of the best copies of the german leather helmet. 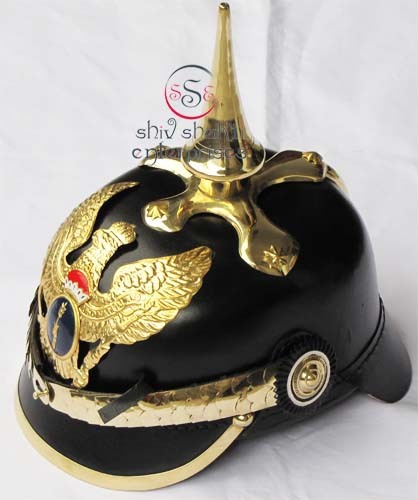 Leather pickelhaube helmet with "Gold FR Eagle With Silver Suum Cuique Badge W/ Ball Spike". Made of leather with brass fittings. It is Handmade as a original one with a leather skull, german brass rivet and edgings, it has adjustable Belt, the front badge is a beautifully hand crafted eagle in brass, the originals of the helmets are rarely found and way too expensive, it is one of the best copies of the german leather helmet. ﻿This Leather Helmet is made of leather with brass fitting. This helmet with Bavarian Badge With Long Spike. 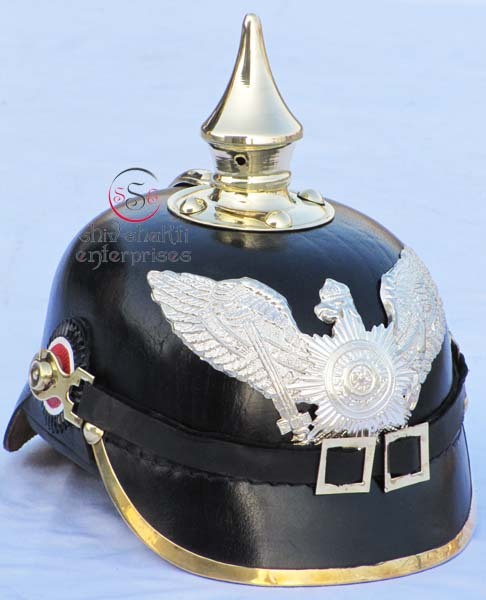 Our client can avail a premium range of Baden Pickelhaube Leather Helmet Which are known for its special features like eye-catching design, hand crafted, good finishing and anti corrosive. These are hand crafted of real leather like original with authentic brass hardware. ﻿This Leather Helmet is made of leather with brass fitting. This helmet with Bavarian Badge With Ball Spike. 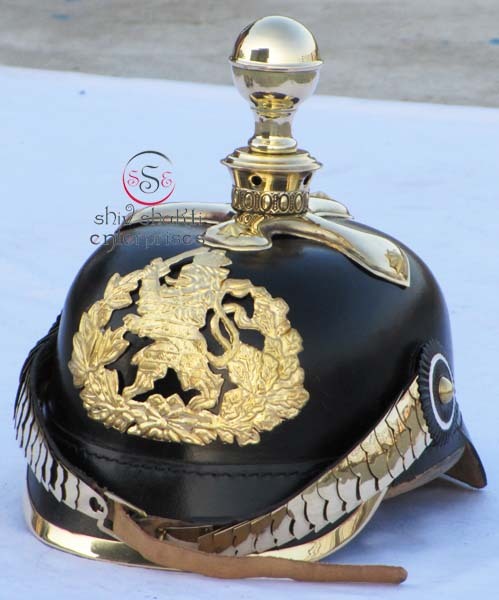 Our client can avail a premium range of Baden Pickelhaube Leather Helmet Which are known for its special features like eye-catching design, hand crafted, good finishing and anti corrosive. These are hand crafted of real leather like original with authentic brass hardware. ﻿This Leather Helmet is made of leather with brass fitting. This helmet with Bavarian Badge With Simple Spike. 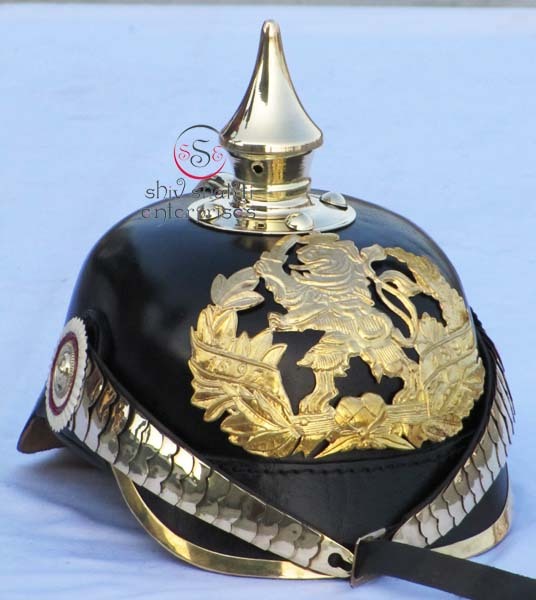 Our client can avail a premium range of Baden Pickelhaube Leather Helmet Which are known for its special features like eye-catching design, hand crafted, good finishing and anti corrosive. These are hand crafted of real leather like original with authentic brass hardware. 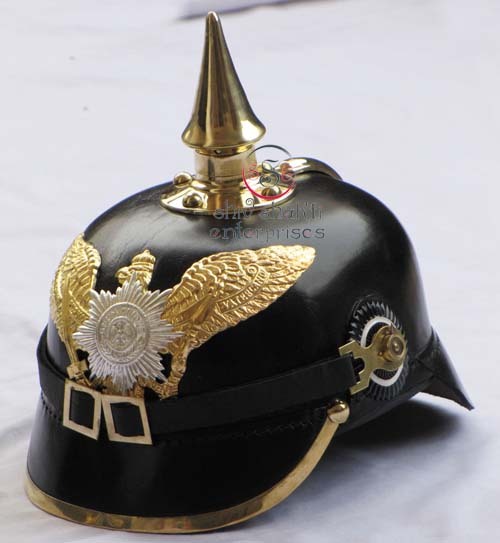 Leather pickelhaube helmet with "Big Eagle Badge W/ Spike". Made of leather with brass fittings. It is Handmade as a original one with a leather skull, german brass rivet and edgings, it has adjustable Belt, the front badge is a beautifully hand crafted eagle in brass, the originals of the helmets are rarely found and way too expensive, it is one of the best copies of the german leather helmet. 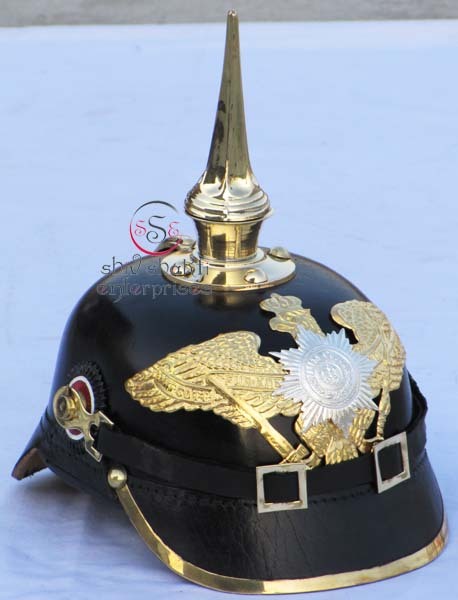 Leather pickelhaube helmet with "Eagle Badge W/ Round Spike". Made of leather with brass fittings. It is Handmade as a original one with a leather skull, german brass rivet and edgings, it has adjustable Belt, the front badge is a beautifully hand crafted eagle in brass, the originals of the helmets are rarely found and way too expensive, it is one of the best copies of the german leather helmet. 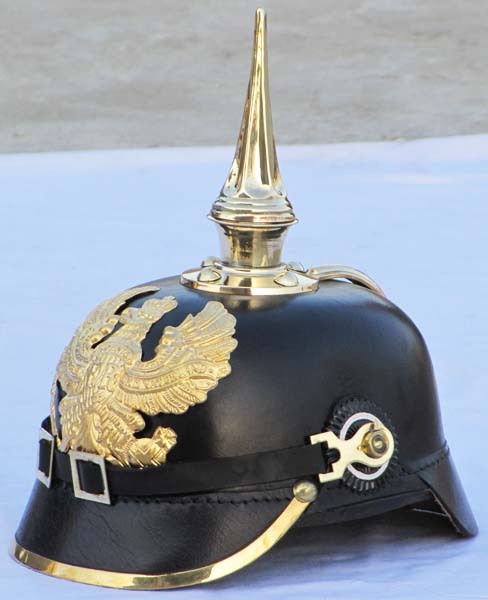 Leather pickelhaube helmet with Round Spike. Made of leather with brass fittings. It is Handmade as a original one with a leather skull, german brass rivet and edgings, it has adjustable Belt, the front badge is a beautifully hand crafted eagle in brass, the originals of the helmets are rarely found and way too expensive, it is one of the best copies of the german leather helmet. 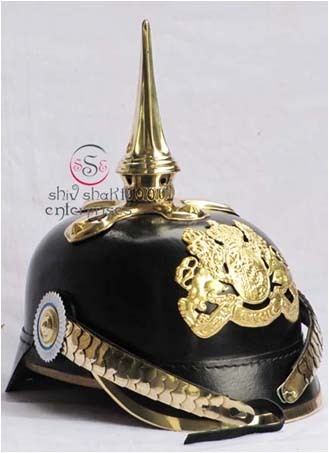 Leather pickelhaube helmet with Long Spike. Made of leather with brass fittings. It is Handmade as a original one with a leather skull, german brass rivet and edgings, it has adjustable Belt, the front badge is a beautifully hand crafted eagle in brass, the originals of the helmets are rarely found and way too expensive, it is one of the best copies of the german leather helmet. Leather pickelhaube helmet with "FR Eagle Badge". Made of leather with brass fittings. It is Handmade as a original one with a leather skull, german brass rivet and edgings, it has adjustable Belt, the front badge is a beautifully hand crafted eagle in brass, the originals of the helmets are rarely found and way too expensive, it is one of the best copies of the german leather helmet. 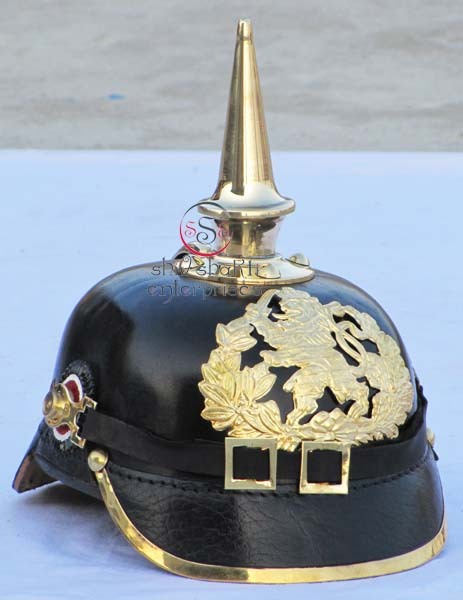 Leather pickelhaube helmet with Small Spike. Made of leather with brass fittings. It is Handmade as a original one with a leather skull, german brass rivet and edgings, it has adjustable Belt, the front badge is a beautifully hand crafted eagle in brass, the originals of the helmets are rarely found and way too expensive, it is one of the best copies of the german leather helmet. 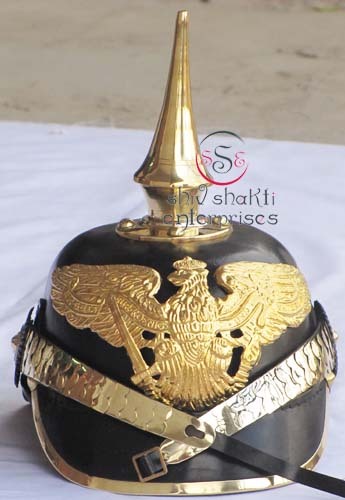 Leather pickelhaube helmet with "Gold Big Eagle With Silver Suum Cuique Badge W/ Round Spike". 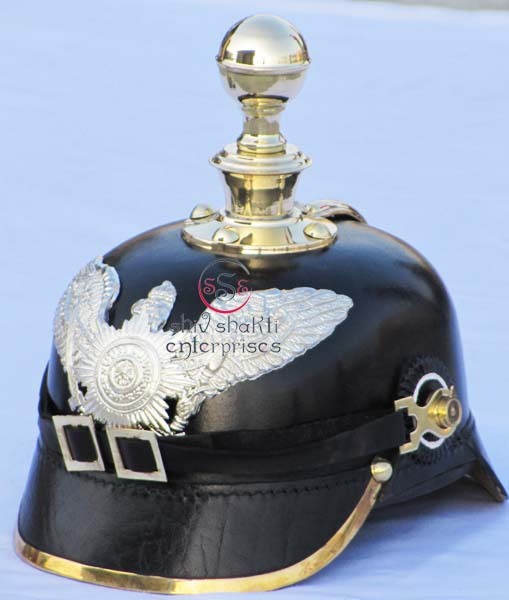 It is Handmade as a original one with a leather skull, german brass rivet and edgings, it has adjustable Belt, the front badge is a beautifully hand crafted eagle in brass, the originals of the helmets are rarely found and way too expensive, it is one of the best copies of the german leather helmet.